Road Runner Girl: The Weekly Chase...Redo! There are some exciting changes coming to The Weekly Chase in January! Melissa at Live, Love, and Run has decided to stop hosting the weekly link up. She asked if any of us weekly chasers were interested in taking it over and I immediately raised my hand!!! Me and Molly from Molly Ritterbeck are going to take on this together and we are sooo excited! We are going to spend the month of December planning and coming up with new ideas to make The Weekly Chase even more fun! So bear with us through this month. 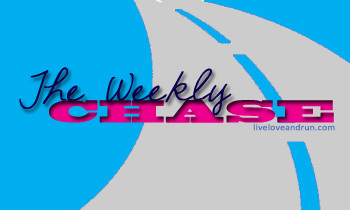 In the meantime I am going to continue to write my weekly chase posts each Monday because I love the accountability. Goal #1: No snacking after dinner. I stuck to this every night but about 2 this week. Why can't I get this one down??? Goal #2: Stretch and foam roll every day. I only did this about 50% this week. Gotta do better this week! Goal #3: Drink at least 64 ounces of water each day. Fail! I drank water but not the amount I should have. Goal #5: Take it easy with running. 100% successful! I definitely took it easy because I didn't run at all last week due to my knee hurting. So since last week was such a failure with my goals I am going to retry most of them again this week. Goal #1: No snacking after 9:00. I'm changing this one up a bit since the after dinner thing isn't working as well. I'm setting the time and hopefully that will help me stick to it better. Goal #4: Restart the 100 pushups challenge. Goal #5: Follow Dr. Justin's orders for my knee. At my doctor's appointment, Dr. Justin told me to take an Epsom Salt bath followed by icing, use Biofreeze twice a day, and stretch. I also have to go see him twice this week. So that's my plan for this week. I will be running the Woman's Half Marathon on Sunday. I'm hoping my knee will do well. I plan on taking it easy at the race just to be sure. And I plan on having a fun girls weekend!!! Please, please keep me accountable this week by asking me on Facebook or twitter how I'm doing with my goals!